Lots of manuals, demos, webinars, info on technical and fundamental analysis. It's not in-depth, but it's more than a lot of sites have. Basic trading guide pages, daily market analysis, economic calendar, world interest rates. 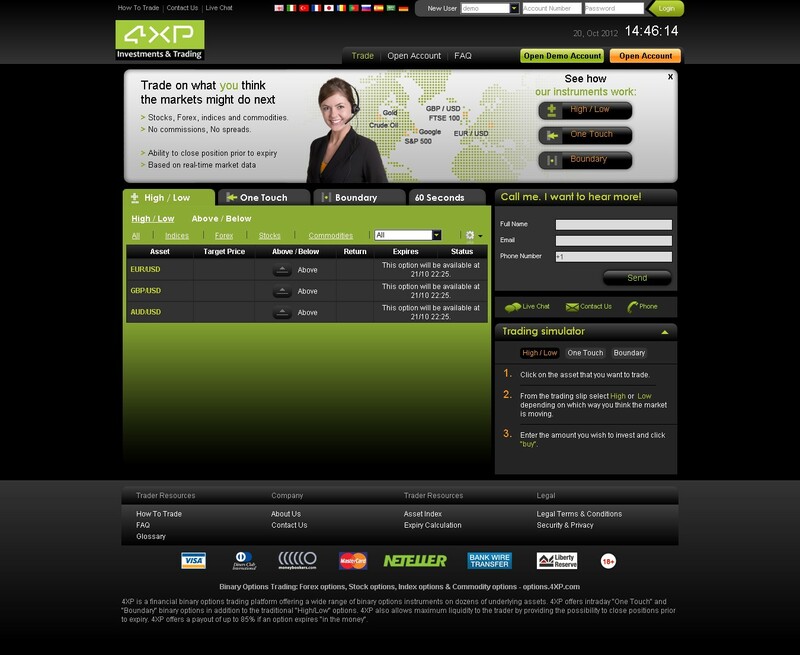 4XP is a company which offers a variety of trading services including binary options trading. They mostly specialize in Forex, thus the name 4XP (“Forex Place”). 4XP’s services are available in a number of different languages to clients around the world, but they do not take US customers and are quite clear about the fact. The company is headquartered in the British Virgin Islands and is not regulated. They appear to be a mixed bag. Good points include a lot of trading resources, a 90-day demo account, and experience in the broader world of trading. There are some negatives in terms of fees, poor flexibility, and reputation, however, to contend with. Things are also a little unclear if you’re signing up for a demo account. Registering takes a few minuets and costs nothing. 4XP offers a demo account, which is excellent. The only problem with it is that it’s difficult to understand what it’s for and how to use it. It’s definitely available for Forex traders; it’s compatible with Metatrader 4, and can be used in conjunction with that platform. The fact that 4XP partners with MT4 is also great, but that platform doesn’t seem to be the one used for binary options. A proprietary 4XP binary options platform is used instead. Whether the demo account can be used to trade binary options isn’t obvious since after you sign up, it simply says thank-you, gives you a demo account number, and no further instructions. There are no email instructions, either. Talking to customer service is the only way to figure out what to do with the demo account. While the website states that multiple currencies can be used to trade, when you sign up only USD shows up on the drop-down list, which is probably a temporary site error. You can deposit using credit card, Skrill, Neteller, wire transfer or Liberty Reserve. Mobile trading is available, which is an excellent feature. The minimum deposit is $100, and match bonuses of up to 30% are offered when you join. This isn’t that high, but that’s not a big deal if you don’t want to use leverage when you trade. There are only around 23 trading instruments listed on the assets page, which is a lot less than we’ve seen offered on other sites. This again isn’t necessarily the end of the world; very few people are going to trade that many assets to begin with. You can trade High/Low or One Touch, or you can try 60 Second options or boundary trades. The minimum trade size is $10. The maximum trade size (and overall exposure limit) is $1,000. This is pretty restrictive, and won’t be adequate for traders with larger accounts. Along with the lack of flexibility with the trade sizes, there is another drawback relating to withdrawals. It’s stated in the FAQ that all withdrawals are subject to a fee of 35 USD each. That’s pretty hefty! Trading resources is one area in which 4XP seems to excel. There are a number of tools available including an economic calendar, world interest rates, and daily market analysis. There are also a lot of manuals, demos, webinars, and other informative pages on the site. There are some discussions on technical and fundamental analysis. They’re not in-depth discussions, but still a lot more than we’ve seen on other sites, at least enough to make traders realize that technical and fundamental analysis exist and are worth looking into. With a lot of BO sites, there is little or no attempt to encourage thoughtful trading. Any sign that a broker is looking for long-term customers instead of people who will trade a couple of times, blow their bankrolls and leave, is a positive sign of trust. As far as customer service goes, there is access via live chat, phone, and email, and apparently service is available 24/6. On a Saturday we were unable to get a hold of an agent via live chat, though the desk claimed that an agent was online. It could be that the agent was simply very busy, but we were uncertain as to whether anyone was really staffing the desk. It is quite common for BO broker desks to say that they are available when in fact they are not. 4XP seems to be a mix of very good and very bad. The resources are definitely something to recommend them, as is their background in FX trading. Since the company has been around since 2009 and has been operating within a broader context, they do have a lot of experience in offering trading services. It’s good that there are a number of trade types available. The maximum trade exposure being set at $1,000 is not so great, though, since it makes it impossible to do large trades if you have a large bankroll. It’s also problematic that there is a required withdrawal fee of $35 for every withdrawal. And there are some issues with the website; the demo account offer is great, but confusing, and there are some inconsistencies in the website’s setup which make it difficult to get clear information without speaking to an agent. There is a list of awards which the company has won from the World Finance Magazine and other websites. We didn’t find links to the actual awards on the sites where they were given when we searched with Google, but there is no reason to believe these awards were not bestowed. Unfortunately we did find a significant number of negative reviews and ratings for 4XP from customers. It wasn’t clear what all of these negatives concerned; it’s not unusual to find customers complaining about a broker when they made foolish trading errors. A number of the reviews did touch upon dubious customer service, however, so we recommend caution when considering 4XP. Test out their customer service team yourself before you commit to trading binary options with them. And remember if you’re interested in trading FX instead, there are plenty of regulated brokers to choose from. This company is a ripp off. Do not trade with them. I am surprised no one shout them down.